Want to be Google’s Valentine 365 Days a Year? This is not a post about some super-secret keyword density, proximity or dispersion formula, new link building techniques or technical SEO mumbo jumbo that will make Google love your website. The fact is these techniques are dying quickly, evolving or are dead already. Unfortunately, many are still poring lots of resources and time into these techniques when they should really be focusing the majority of their resources and time on what Google really loves, whether it’s Valentine’s Day or not. As demonstrated in 2012 Will Divide SEO Practitioners Into Two Camps, 2011 was certainly the year Google and technical SEO parted ways. It was a messy divorce, too, that was strewn across countless blogs and even The New York Times. Awkwardly, many SEOs are having a hard time accepting the breakup while some fair-weather online marketers don’t even know it occurred. For years now, Google has recommended to webmasters to always provide unique and relevant content that gives users a reason to visit the site. What does sculpting on-page factors or paying companies in India to build thousands of spammy backlinks have to do with that? Nothing. . . Every piece of content published on the web represents new opportunities to be found in the search engines. Between Panda and the Caffeine update “Freshness,” content is now truly Google’s Valentine. 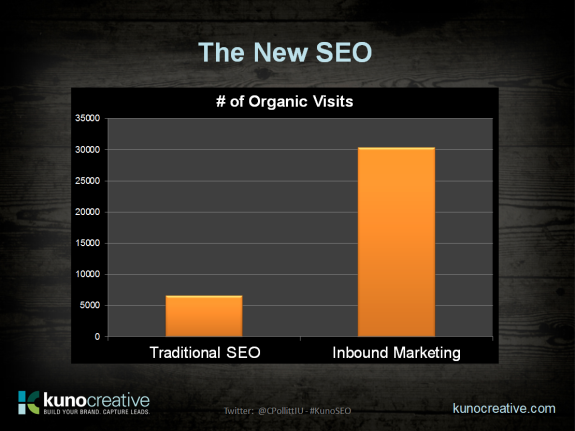 Below is the amount of organic search traffic from traditional SEO versus a robust content marketing deployment. This demonstrates the value of focusing the majority of resources on inbound marketing rather than technical SEO tactics. It is quite common to see online marketing folks tout social media as the new SEO these days. While Facebook is cited in one out of five divorces in the US, social media certainly isn’t Google’s new fling and it didn’t cause Google to leave traditional SEO either. However, it did help facilitate the breakup. Too many Expertum Social Medium’s out there like to complicate social media by inventing nuanced definitions and complicated methodologies when describing it. Social media at its base is nothing more than a content distribution channel allowing content to be shared, consumed and evangelized in a highly efficient manner. Touting social media as the new SEO is like blaming the road connecting two people’s towns for their relationship. While the road certainly made it easier for them to see one another, it most likely was not the deciding factor in their choice to be a couple. Google wants to answer people’s queries with the best, most timely content available on the web. Social media provides a distribution channel for that content. Ultimately though, it is the content that Google ranks well and not social media per se. To continue the analogy of the road above, picture Google as a helicopter flying over a city. The roads that are most congested signal to Google where the popular content is. That’s why Google is now married to content marketing and not having an affair with social media. 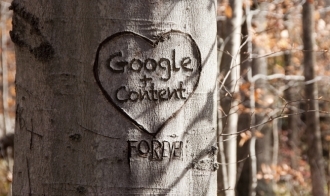 So if you want to be Google's Valentine 365 days a year deploy a content marketing campaign today.